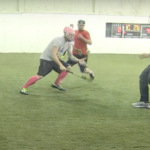 Back to Ballin’ on E. Bay St.
On March 9th, the “freshest game on ‘grass’” returns for more insane Indoor Hurling with the Tacoma Hounds! The draft is complete, the jerseys are ordered, and everyone’s eyein’ that single-digit-day countdown to the best show in T-Town. 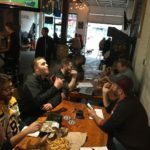 The 2018 Indoor Draft is finalized! If you have seen the main page overhaul of the Tacoma Hounds’ website, you should know that Indoor League kicks off tonight! You can catch us over at the Tacoma Soccer Center (2610 E Bay St, Tacoma, WA 98421) every Wednesday through November 14th, playing indoor matches from 700pm-830. 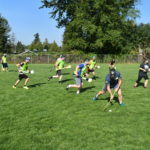 In August, the Tacoma Hounds hosted a series of “Rookie Days” to help introduce Hurling to new players. 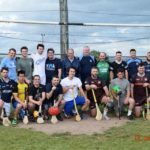 The series spanned 4 Saturdays (8/11, 8/18, 8/25, and 9/1), comprehensively covering Hurling’s numerous skills so that any first-time participant would be taken through every aspect of playing. The Tacoma Hounds in Ireland! 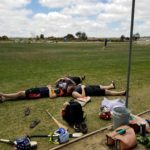 Back on June 13th, some of the Tacoma Hounds flew over to Ireland for an action-packed week-and-a-half of Hurling activity! Tacoma Hounds at the Sumner Smackdown! 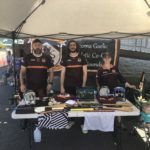 On July 14th, the Tacoma Hounds were able to volunteer and set up a recruitment booth at Sumner CrossFit’s “Sumner Smackdown” event. The competition took place at Sunset Stadium on Main St. in Sumner. Over Memorial Day Weekend in May, the Hounds traveled down to San Diego to volunteer and help run part of this year’s West Coast 7s competition by coordinating Field 3. The tournament’s group stage began on Saturday (5/26), with the Semi-Final and Final rounds culminating on Sunday (5/27).